Other than accessing your design assets from the iClone gallery panels, users can manage design resources in a quick way by knowing where the files are actually located in your hard drive. You are highly recommended to create those shortcuts on your desktop for frequent resource access. This path keeps projects preinstalled in the iClone program, or further content auto installed from iClone content packs. The data files stored in the Template folder serve as template projects and contents, users can not overwrite, move or delete them from iClone program. The prior version of iClone is installed to C:\Program Files\Reallusion\iClone\Template\iClone Template. For power users, you can manage your template folder via Windows file manager. Users own creation are stored in the User Custom Folder, users can delete, move, rename, update those projects from the iClone program. C:\Documents and Settings\All Users\Documents\Reallusion\Custom\iClone Custom. It is recommended for all the iClone users having installed prior version of iClone to copy these files manually to the corresponding folders in the path listed above. 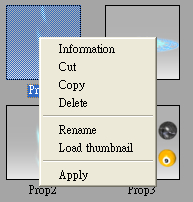 You can customize your own thumb image representing your unique design assets by right clicking on gallery items then choose- load custom thumbnail. All resource data is wrapped in project files (in VNS format) such as Character, Props or Scene, no external resource file or linkage required. Independent assets are easy to transfer between computers. Since all projects, props and motion are stored in iClone universal VNS file format, please make sure to copy VNS files to their corresponding category folder. iClone will always keep the latest accessed folder as the file open destination, easy for you to re-access those most recently used design assets. Change the default project from the female character to any other project. Prefer to have an empty scene to start with? Wish to have a 3D grid floor as default for quick reference? To save your current project as default project, go to the Project / Modify panel and press “Set Default”.